Develop the confidence to attract, create and maintain meaningful relationships in your life by becoming comfortable within yourself and around others. This very special self help hypnosis program will improve your sense of self worth and confidence in yourself and others. It will assist your adaptability skills and help you communicate with people better. It is also useful if you are in a 'controlling' or unhappy relationship and will help you make up your own mind if you want to stay or end the relationship in a sensible and logical manner. Ultimately it will help you become happier with who you are and to grow as a person. Often it is how we view ourselves that affects how we view others. If you have a negative self image then it is likely that you will have negative relationships with other people. This recording is designed to turn this around and help you love yourself to love others. It will allow you to NOT automatically pass judgment on others and to listen to what they have to say. Doing this is the key to creating better relationships with all the people in your life as lack of communication is the number one cause of all relationship breakdowns. 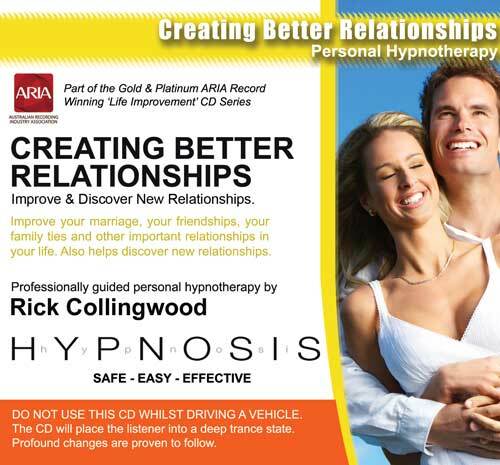 By using this CD or MP3 you will automatically become more sensitive to those around you and always have an 'open ear'. I purchased a couple of CD’s, Super Memory and Relationship Confidence about 10 days ago. I am very impressed with the quality and would like to buy a number of other titles. I have been married 11 years and was under the impression that the Relationship Confidence tape would do focus on improving the relationships I have with spouse, family and friends. However, the Relationship Confidence CD is has a particular focus aimed at people who wish to attract a long term romantic relationship which is not what I was thinking of. Please could you tell me if I could change this CD for another. Whether I do this through you or take it back to the shop where I got it. I cried last night during the relationships one and all this tension came up but it now seems like something has been removed from my brain. It is amazing. And I still think of the bag floating away with all the past stuff in it. Sorry if that seems a bit strange in description; but there is no doubt I am seeing the world differently. I have passed on your site to others. JB had a sale of your CD’s today, so I brought 3 and will use them down the track. I just feel so different, peaceful, less worried. Again thanks, these CD’s have really shifted some things that have not been dealt with for 30 years. I have tried your life improvement cds and have had such amazing results it still continues to awe me. After years of counselling, alternative healing, self-help books, self-help/spiritual growth workshops, and anything else that’s on the new age market right now, I’ve never had such rapid, multi-faceted and remarkable results as I’ve gained from using your cds. They are truly a gift to the society. Thank you so much!